The first title awarded in the forth and last day of the Indoor World Championships in Portland was the 3.000m men; close to the finishing line, the American Ryan Hill (7’57″39) stretched but he did not manage to catch the golden medal achieved by Yomif Kejelcha (7’57″21) but he succeeded in surpassing Augustine Choge (7’57″43) getting the silver medal. In the women 800m, final sprint for the medals; Francine Niyonsaba wins in 2’00″01, second place for Ajee Wilson in 2’00″27 and third for Margaret Wambui in 2’00″44, PB. In the women 3.000m, the most awaited was the world record holder Genzebe Dibaba; after some lap, she came on the top leaving the others half straight behind, followed by Meseret Defar who outstripped the remaining runners to reach the silver medal. Dibaba enhanced the distance in the last lap stretching on the finishing line and concluding in 8’47″44, Meseret Defar finished in second position in 8’54″26 while Shannon Rowbury is third with 8’55″55. The last 100m have been decisive for the male 1.500m; Nicholas Willis stayed on the top but he did not manage to boost in the end and he conclued on the third place with 3’44″37. Matthew Centrowitz (3’44″22) won, instead, only because Jakub Holusa (3’44″30) ran behind the lines the whole race and starting pushing too late, a delay which did not allow him to gain the first place. In the high jump, Alessia Trost did not succeed in repeating the team mate Gianmarco Tamberi’s performance; she jumped 1.84m and 1.89m at the first attempt, mistake at 1.93m and she finds a wall at 1.96m not managing to overreach it, seventh place for her. 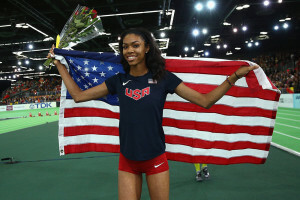 The 18 years old Vashti Cunningham is, no doubt, the surprise of this World Championships. She is the new U20 world record holder, winning the golden medal with 1.96m. The second and third place of Ruth Beitia and Kamila Licwinko respectively, did the same measure. In the male long jump, a new golden medal went to an American athlete, Marquis Dendy, who with the second jump of 8.26m won the golden medal; silver medal to the Australian Fabrice Lapierre who jumped a centimeter less than the first one, 8.25m, setting the Continental Record. The third place went to the Chinese Changzhou Huang (8.21m). The Jamaican Omar McLeod started really fast on the 60hs, keeping the first place and finishing in 7″41, best time of the year. Pascal Martinot-Lagarde won the umpteenth silver medal with 7″46, Dimitri Bascou in 7″48 completed the podium. Women 4×400 unlucky for Jamaica: Patricia Hall fell before reaching the final straight, no run-up for the golden medal for the Jamaican team. Another golden medal to USA (3’26″38), silver medal to Polonia (3’31″15) and bronze to Romania (3’31″51). American double-winning with the first place in the male relay in 3’02″45, second place for Bahamas and third for Trinidad; Belgium loses the baton.